Our Director March for guitar. Back to index of guitar pages. In the March 1997 issue of the Washington Guitar Society newsletter I included a guitar version of "Our Director March", published and arranged by Walter Jacobs. The accompanying article included a bit of the history of this renowned march, and my arguments in defense of playing music that many people would turn their noses up at. Indeed, I say play anything you can get your hands on. I also left in some personal, anecdotal material. Feel free to tune out whenever and wherever you'd like. According to the Heritage Encyclopedia of Band Music, Our Director is "one of the most famous of all marches. It has been adapted by countless schools, colleges, clubs and other organizations as their alma mater or fight song." Not too shabby, eh? Our Director was the first of only 3 known works by Frederick Ellsworth Bigelow (1873-1929.) 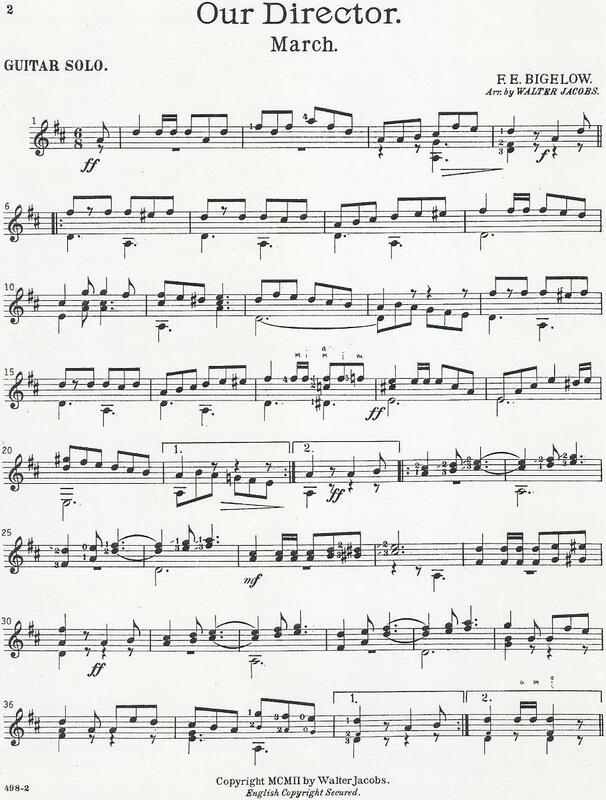 It was first published in 1895 and arrangements have been published throughout this century [oops, the 20th, that is], one at least as recently as 1985. It has an odd tie-in to the guitar world in that Walter Jacobs, American guitarist and publisher, bought an entire catalog of orchestral music just to obtain the rights to Our Director. But this 1902 edition is not a result of that; he purchased the catalog in 1917. In that year Jacobs published a version with words by Jack Yellen (of Ain't She Sweet fame) called The Battle Song Of Liberty. I know that 19th century music of any sort, and American in particular, doesn't thrill everybody. A piece like this might invite the question, why play something if it isn't great? First of all, don't knock it until you've played it without flubs at a good tempo, dotted quarter = 104, say. If you still don't like it, maybe you should ask what your problem is. After all, the piece has given a lot of other people a lot of pleasure. Who's to say it isn't great? Another reason is simply for the reading practice. Time spent reading this will make your first spin through a Bach, Brouwer or you-name-it piece just a little smoother and easier. Another reason is for the historical interest. This is what got toes tapping back then. Wouldn't it be a drag if it were no different from what's going on now? Playing from an original or facsimile helps to boost the "time traveling" sensation. Another reason is the satisfaction that comes with not following everybody else's beaten, trodden path. Sometimes I've gone overboard, ranting that you shouldn't work on anything recorded or performed by somebody else. That's crazy, of course, but the quantity and variety of music out there is staggering. And you're not obligated to make a long-term commitment to this or any piece. In this case, if you leave out repeats, you can get back to the "great" stuff - whatever that may be - in a minute and 40 seconds. The preceding background notes and editorializing are actually unrelated to what gave me the initial bug to present this piece. There's a more personal reason. When I stumbled on it in the Library of Congress, I realized, Holy smokes! This is the one my old piano teacher used to pound out as his "show piece"! His name was Mr. Peverill. He was bald and he did magic tricks. My older sisters had started lessons with him before I did. That was maybe 5th or 6th grade. I was a crummy pupil. In spite of that, the piano lessons gave me a good grounding in reading and making music, and the eventual benefit to my life has been immeasurable. So... I want to thank my parents, Benton and Jane, for the piano lessons - not to mention a billion and one other things. Below: Our Director March, arranged for guitar by Walter Jacobs. 1. Guide finger dashes, right-hand fingerings, and all handwritten left-hand fingerings have been added by me. Also see the comments provided with the tablature below. 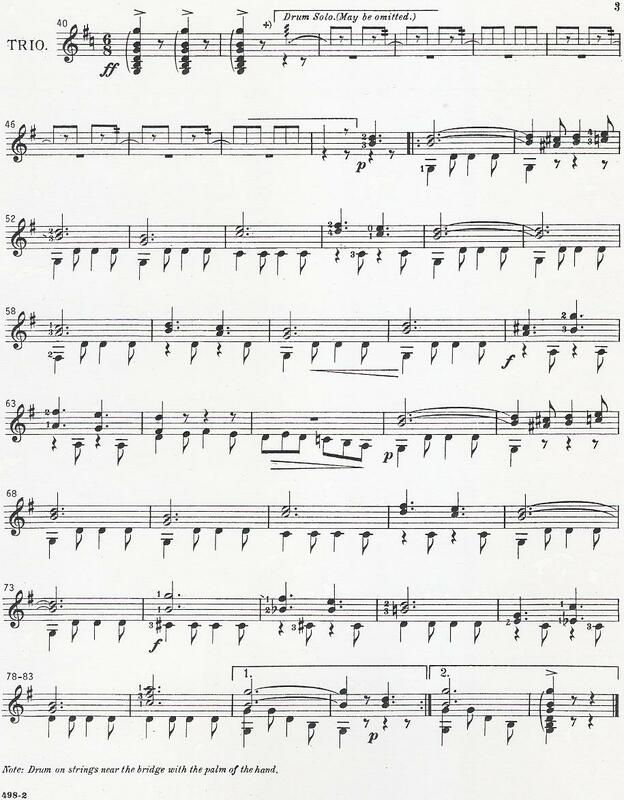 See the piano version on the Levy Sheet Music site for a clearly notated rhythm for the "Drum Solo" section. 2. A copy of this piece can be found in the Library of Congress, call number M127 B. I thank the Library of Congress. The cover copied poorly because the copier treated the dark orange color, if I remember, about the same as the black ink. The stamp on the cover reads: The Library of Congress. Two copies received. May 2 1902. COPYRIGHT ENTRY May 2-1902. Class C XXo. No. 26357. Copy B. 3. Reference: The Heritage Encyclopedia of Band Music by William H. Rehrig, edited by Paul E. Bierley. 1991. The easy-to-read tablature below is faithful to the published transcription in music notation. It uses only common keyboard characters. It's very simple and instantly usable. Click here for some general comments on the modern tablature, including tips on printing it out perfectly. rhythm stems; I've written "trem." above the staff. rasgueados where tremelo is notated and tambora for the simple 8th notes. The snare drum effect would be great, but it's hard to load up in time. exactly what is being tied over? the ^ arrowhead right at the top of the stem.
. = rest. Applies specifically to the previously sounding note on that string. the bass note sounding from the previous measure. - or _ = accent or emphasis mark. Original uses > symbol. the same range of music as the skinny angle symbols do on the original. 1 6 10 15 20 25 30 36. Page 2: 40 46 52 58 63 68 73 78. Last measure is 83. Our Director. March. OD: Page 1 of 3. Arr. by Walter Jacobs. Leading measures: 1 8 16 22 31. 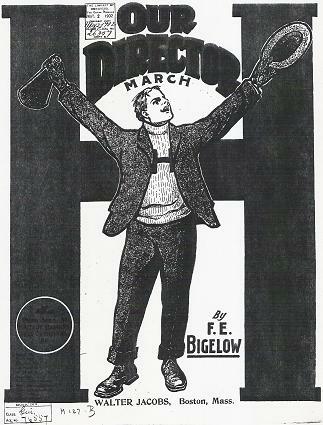 F. E. Bigelow. Bigelow. Our Director. Leading measures: 39 45 52 60 69. OD: Page 2 of 3.
ff -    -      -   trem. trem. trem. Bigelow. Our Director. Leading measures: 77. OD: Page 3 of 3.